It is no secret to long-term readers of this site that i am a fan of psychedelic Connecticut-based band Landing. Third Sight is their latest release, an EP with 4 songs. 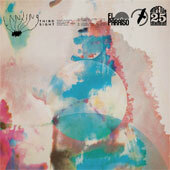 This record is part of the Impetus Series from El Paraiso Records. I have never heard of either of these things, but poking around on the internet i see that the record label is a Danish label run by Jonas Munk (aka, Manual) and Jakob Skøtt (who is also a recording artist, but i have never heard of him before). The Impetus Series is specifically "all about high quality, environmentally friendly vinyl in limited quantities. Music that is based on impulse, improvisation and chance collaborations. [sic]"
So, a limited edition vinyl improved release from a band i like, and here mastered by Jonas Munk (Manual), another artist i enjoy. Four tracks on beautiful gray vinyl. This is full of win for me. The A-side kicks off with Delusion Sound, a thirteen minute opus that starts with three minutes of oddly percussive noodling then suddenly pops into a regular Landing pop song, with Aaron Snow singing in his hushed voice as his guitar strums. The song ebbs and flows, becoming a long drawn out wandering ambience reminiscent of their work on Oceanless. Landing round out the A-side with Third Site, a meagre six minute tune. This song is more echoing ambience. Keyboards tinkle as the guitar grinds, both combining to make a hazy disorientation. It’s a lovely little tune to get lost in. The B-side starts off with Facing South, about ten minutes of tinkling guitar and droning keyboard, the Snows doing what they do best. This is a slow, meandering tune, the kind of thing that i like to put on to just relax to. A nice, mellow, musical haze. And finally the records ends with the fourteen and a half minute Morning Sun. Interestingly, Landing made a video for this song and released it onto the Internet prior to the release of the record. I don’t think i have seen a video from Landing before, but this one is pretty much would you would expect: a series of strange images including abstract art, sciencey stuff, and musical instruments, all in layers that slide across each other. Occasionally they part to reveal Adrienne Snow singing. It's a beautiful spaced out video for an excellent spaced out song. I love what Landing are doing here, playing around in their defined sonic area. However, i can see how the amorphous nature of this recording will not appeal to people who are not "into it". I get that. Maybe this is a release for their fans. If so, this fan is very pleased.